If you're looking for a classic, rustic, buffalo-based venue for your event, La Galleria Events is the perfect option for you. After being in business for over 43 years, La Galleria Events knows how to make an event personal, professional, and, most importantly, with your vision in mind. La Galleria Events, an event venue that has been in existence for over 43 years, is a family run business with the heart of Buffalo. Located next door to New Era field where the Buffalo Bills play, this was literally built by Buffalo. 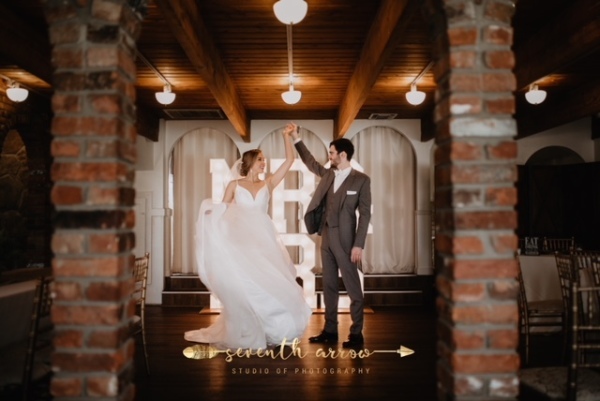 All of the rustic brick throughout the building is re-purposed brick from different old structures around Buffalo, the beams in the Elmwood room are from an actual warehouse that used to reside on Elmwood Ave, and the stones throughout the walls and the bars are from 18 mile creek. When you're looking for the perfect place to hold your event, you need the perfect team to help you along the way. The event coordinators Cherie, Julianne, Gabriella, and Jill will help you plan your perfect event from beginning to end. Not only will they aid you in making decisions for your event but they are happy to offer suggestions in all of the different aspects of your event. They work to get to know you and exactly how you want your wedding day. The day of the event a coordinator is on site through dessert to ensure that everything goes smoothly. Hold the event you've always dreamed of. Hold it at La Galleria Events. "The venue and staff at LaGalleria are wonderful! We got married here on 4/30/17 and the day would not have ran as smoothly as it did without the diligent help of Cherie, Julianne and the rest of the staff at LaGalleria. During our planning process we probably exchanged 50+ emails! All which were so promptly responded to. The ladies here are dedicated to making sure your day is how you want it. They are personable, (Cherie was the only one out of all the venues we visitedto ask us the story of how we met before bringing up dollar signs, unlike the other venues we visited) they are also patient, flexible, and extremely attentive to detail. (The day of the wedding while taking pictures, Julianne ran back to the bridal suite to grab my lipgloss for a touch up.) Small, but it meant a whole lot in the moment! The venue is just beautiful. The exposed brick arches are my favorite! You will not regret choosing LaGalleria as your wedding venue!" "I recently had my wedding reception at LaGalleria and was very pleased. When my husband and I were looking for venues, we were on a budget. This venue was absolutely the nicest for the price. It's got a rustic feel inside, and was just different than the typical banquet hall. We chose to do family style for our dinner and the food was great! We had pasta with alfredo as one of our side dishes, which was some of the best alfredo I've ever had. All of the food was delicious! The staff was friendly and made the night go smoothly. I would recommend this venue to anyone that is looking for a place that's different for a good price." " We cannot recommend La Galleria highly enough to anyone planning their wedding reception. Starting with our initial meeting, Cherie and the rest of the La Galleria staff were so accommodating, professional, and lovely to work with. Cherie recommended some awesome vendors, including the DJ that we ultimately chose, and was always there when we had a question or concern regarding our reception. Any questions that we had were answered in a timely fashion as many times as we needed. Every single guest that we spoke with complimented the quality of the food. We still don’t know what magic they worked on the pork chops but they were soooo good! And the rice pilaf, the vegetable medley and roast choice top sirloin of beef were all wonderfully prepared and delicious too. The servers and staff were very professional and took care of everything quickly and efficiently. If we had to do it all over again, we would choose them again without hesitation." "We had our wedding here on New Years Eve 2016 and I've wished every day since that we could repeat it all over again it was so perfect! From the moment we first contacted La Galleria we knew they had something that no other place we had looked at had: real people who were just as excited for our wedding as we were. They answered every single email as close to immediately as you can get (considering most of our emails were late at night while trying to plan). We changed our colors and center piece ideas probably 100 times and each time they told us we were more than welcome to bring some ideas over and see what everything would look like on the tables/in our room. We had a hard time finding/deciding on some vendors so they gave us lists and contacts for all of them to help us get through our decision making. We had brie stuffed chicken and apple brandy pork (he got one and I got the other so we could share) and we couldn't stop eating and we were stuffed by the end of the meal. "